Oak Park lies on top of the shore of the ancient, glacial "Lake Chicago." The long arm of beach gravel and sand that formed between Lake Chicago and the Des Plaines Bay is known as the "Oak Park Spit." This ridge, which runs diagonally from Ridgeland and North Avenues to Madison Street and Des Plaines Avenue where it levels out, is now mostly flattened by development. The high curve of this ridge occurs at Oak Park Avenue and Ontario Street, crossing Scoville Park. Since the land was once covered by oak trees it was originally named Oak Ridge. This was the land of the Potowatomi, Sac and Fox Indians. In 1835 Joseph and Betty Kettlestrings came from Yorkshire, England, and built a small frame house near Lake Street and Harlem Avenue made with lumber from the saw mill that drew them to the area. Since the Kettlestrings farm was one of the few homes between the small growing town of Chicago and the Des Plaines River, it became a tavern and the Kettlestrings charged 50 cents for supper, bed and breakfast. The quarter section that the Kettlestrings staked was known by a series of names including Kettlestrings Grove, Oak Ridge, and Harlem. 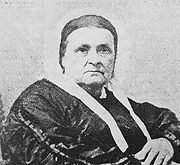 In 1843 there were a few more settlers, but no schools, so the Kettlestrings rented out their farm and moved to Chicago with their growing family. Returning in 1855 the Kettlestrings built a more substantial home which was eventually moved to Scoville and Lake Streets where it stood until 1935 when it was demolished to make room for the expansion of the OPRF High School. Kettlestrings continued to sell off parcels of the large land holdings to people who followed the Galena & Chicago Union Railroad (1848), the first train to run west of Chicago. The railway station was eventually named Oak Park to match the post office. The Post Office had this name because the name of Oak Ridge was already taken. Oak Park became the official name of the area which was still unincorporated and officially part of Cicero Township until 1902. The Chicago Fire of 1871 created a boom development as Chicago residents left the city to build in the suburbs. The population was about 500 the year of the fire and was listed at 4,589 in 1890. Religious organizations built so many churches during the 1870s that Oak Park became known as "Saints' Rest." Citizens during this time could join a variety of clubs. Many of these groups met in the Scoville Institute, now the site of the present Oak Park Library at Lake Street and Grove Avenue. The Institute was a gift of James W. Scoville, a real estate developer, whose home stood on the site of the present Scoville Park, and served as a cultural and civic center as well as a library. A regular school district was organized in 1857 with one teacher and a class of 29 students. 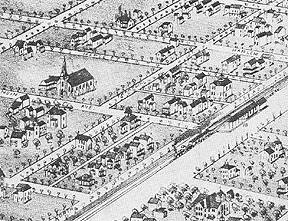 In 1859 a new school, Central School, later named Lowell School, was built at the corner of Lake Street and Forest Avenue. In 1879 the Ridgeland School, later William Beye School, was built to serve what is now east Oak Park. Additional schools were constructed as the population rapidly increased. Until 1873 public education was only offered to eighth grade. The first high school graduating class in 1877 had only three members. 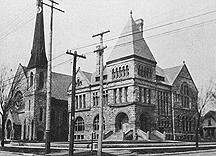 The first high school building was erected in 1891 on the southwest corner of Lake Street and East Avenue. The first building on the current site opened in 1907 as Oak Park and River Forest High School. Parochial schools Ascension, St. Catherine/St. Lucy, St. Edmunds, St. Giles and Fenwick High School were established over the years. The period 1892-1950 saw the construction of almost all of the housing stock in Oak Park, and most of the village's current buildings. During the 1920s, large Chicago stores such as Marshall Fields and The Fair opened branches on Lake Street. 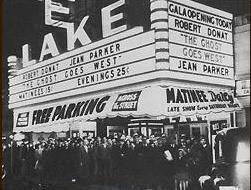 The Lake Theatre opened in 1936. Previously there had been a debate on the local ballots regarding the showing of Sunday movies. Eventually, in 1932 the proposition passed. By 1930, the village had a population of 64,000, even larger than the current population. 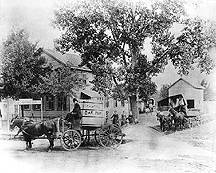 Oak Park continued to grow as the vacant land was built upon with homes, churches, businesses and schools. 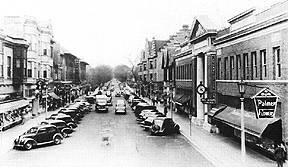 Oak Park became widely known as the "World's Largest Village." As a mature community, Oak Park struggled to remain vibrant. As part of its efforts, Oak Park embraced its rich heritage and noted legacies of Wright, Hemingway, and others. But post-war America was not to be so simple. Oak Park throughout its years has taken positive steps to manage change while keeping stability. The Open Housing Ordinance of 1968 was a statement in support of integrated housing and in 1973 the Village Trustees created a policy statement, "Maintaining Diversity in Oak Park" which stated in part, "The people of Oak Park have chosen this community, not so much as a place to live, but as a way of life. A key ingredient is the diversity of these same people a broad representation of various occupations, professions, ages and income levels. Such diversity is Oak Park's strength." In 1976, the village was designated an "All American City" and is today still a model community for dealing with the manifest complications of life in a "small town" in the middle of a metropolitan region filled with millions of residents.